onflicts can be expected to arise in even the strongest of relationships. C ommonly, one of the partners just doesn’t see that there is a problem, and therefore fails to see his or her contribution to the difficulties. Whatever the reason, there are times when one partner is simply not ready to work mutually on the relationship. This is a fact which must be accepted. But it does not mean that the relationship is doomed. Rather than condemning our partner for his or her inability to work on the relationship, it is far more productive to show respect for our partner’s view and to take matters for bettering the relationship into our own hands. There is a great deal that one partner, acting alone, can do to create a relationship which is happier and more fulfilling for both parties. Working alone on a relationship problem can mean that we have to take a look at our own issues and our contribution to the difficulties with our partner. While this challenge is not always easy, the payoff in terms of our own emotional wellness can be enormous, both for our own future personal happiness and for the success of our relationship. Working solo on a relationship may mean coming to terms with the anger we have fostered (perhaps for years), taking responsibility for our own happiness, breaking out of our old ways of seeing the world, changing our expectations about how we should live everyday, and accepting the good in our relationship as being good enough. It may mean letting go of some of our most entrenched behaviors. We may even find that letting go can bring us tremendous rewards that we never expected. We often look to our partner to provide for our needs, and this can be a big mistake. People, whether they are in a relationship or not, need to function in a whole and complete manner. The best relationships are generally those in which two healthy and fully functioning adults come together and enhance each other with love, support, trust and nurturance. They appreciate the gestures of love that they receive from their partner, but they would be able to live full and complete lives even if they were not in a relationship. We sometimes think that the two people should give equally to the relationship in order to achieve a balance – but it may be more productive to see the balance in a different way. Think instead about achieving a balance within yourself, so that the question becomes one of deciding how much to give to the relationship and how much to give to yourself. There are some things that you may want and which you can provide for yourself. You see these things as non-negotiable. For example, if your partner is always late for social events and you find this unacceptable, try going once alone – and the next time your partner will probably be ready on time. If your partner feels threatened by this, gets angry and starts an argument, try showing some empathy and decisiveness. Don’t participate in the argument. Simply say that you understand your partner’s feelings, but that this is something which is very important to you and you have decided to do it. It does not mean that you are rejecting or abandoning your partner, but it does mean that you are asserting yourself in a healthy way and taking care of your own needs. A simple act of assertiveness can often break a destructive pattern of mutual neediness. Each partner in a relationship plays a role. It is important to identify the role that each of you plays and then try to make a change. One way of accomplishing this is to identify your role and then do the exact opposite. This takes courage, because of fear that abandoning our previous role will only make the problem worse. In truth, however, changing this role will compel your partner to make a change as well, a change which may enhance the relationship. For example, Joan complains that Jeff plays golf all the time and doesn’t have time for her. Joan plays the role of the one who nags and Jeff plays the role of the one who rebels by playing golf. If Joan were to change her role from nagging to supporting, Jeff might make a change from rebelling to cooperating. Joan could learn to play golf herself, ask Jeff about his day on the course, and buy him some golf-related gifts. She could also cultivate her own interests. Jeff, in turn, realizing that Joan is now doing the exact opposite of what she had been doing, will no longer feel that he has to rebel against her. Because she shows support for his interests, he will then reciprocate by showing more concern for her needs. People respond much more readily to support than to criticism. The old destructive pattern has now been broken and each partner is now free both to pursue their own needs and to give to the other. When we are involved in a relationship conflict we often resort to all-or-nothing thinking, and it is difficult to think outside of this box – “I am right and my partner is wrong.” The more you insist on your point of view, the more your partner defends his or her position. The two opposing ways of thinking become entrenched. It is helpful to defuse the situation by trying to develop empathy for your partner’s point of view and by relaxing the sense of urgency you have about your own views. The following thoughts can help to increase the flexibility of your thinking: “My partner is just being herself. She means no harm. She’s trying to do her best. I need to appreciate her just the way she is. I need to stop trying to change her or to convince her that I am right.” When you try to get your partner to see things the way you do, you are actually searching for love and closeness. You want complete support, a partner who can affirm your way of thinking. Understand, though, that this is exactly what your partner is searching for too. Try to empathize with your partner’s view, and this can open the door to the closeness you want. You may feel an urgency or anxiety about asserting your own view. You don’t have to abandon your views, but you can work on the anxiety you feel about affirming your views. It helps to take a live-and-let-live approach to your struggle. Relax – and trust that things will work out well. And they often do. Working alone on your relationship means working on yourself. By making a shift in how you define your own sense of self, thoughts and feelings, you can help create the conditions which bring your relationship into a state of mutual harmony, support and love. A trained professional therapist can help you identify and modify patterns in the way you approach your relationship. The rewards can be immeasurable – for both you and your partner. No, it is not fair – but that’s all right. Consider the alternatives. You can stay in a deadlocked relationship if you choose, but then each partner loses the potential benefits that can come from a healthier and more supportive commitment. 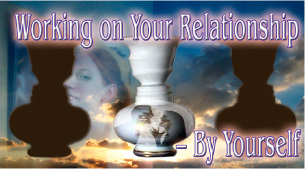 Or you can let the relationship dissolve completely. This may be a viable option if the situation is intolerable, abusive, or completely mismatched. However, if there is a chance that the relationship can work, it is worth trying different approaches which have not been considered in the past. After all, ending a relationship before considering alternatives may represent an absence of fairness and a potential source of regret in the future. When considering the idea of fairness, remember that many things in life are not fair. Illness, financial setbacks, and grievous losses come to the best of people. Even if there were complete equality between you and your partner, there is no assurance that the problems in your relationship would be solved. Part of the human condition is to persist even when circumstances are not ideal. Your partner may lack the ability to provide equal input into solving the problems of your relationship. This is something worthy of acceptance. It is not ideal, but it is reality. Sometimes the strength and courage of one person is needed to compensate for the shortcomings of another. The real test of fairness is to question whether you are creating the best life you can. In any relationship, we need to provide a balance, not necessarily between the two partners, but on the dimension of balancing your own needs against the needs of the relationship. The source of your happiness lies within and is derived from your physical, emotional, mental and spiritual strengths. Working on these factors within yourself puts you into a firm position to attend to the demands of your relationship. A relationship requires flexibility, effective communication, some hard work, and a lot of good will. When we feel complete within, we are in a strong position to create the conditions which can lead to a healthy and thriving relationship. Perhaps there is some truth in the old saying that it is only when we love ourselves that we can truly love another.